The Carol Martin Gatton Academy of Mathematics and Science in Kentucky is an opportunity for some of the Commonwealth's brightest high school students. This page contains relevant details for prospective students and their families regarding the admissions process. 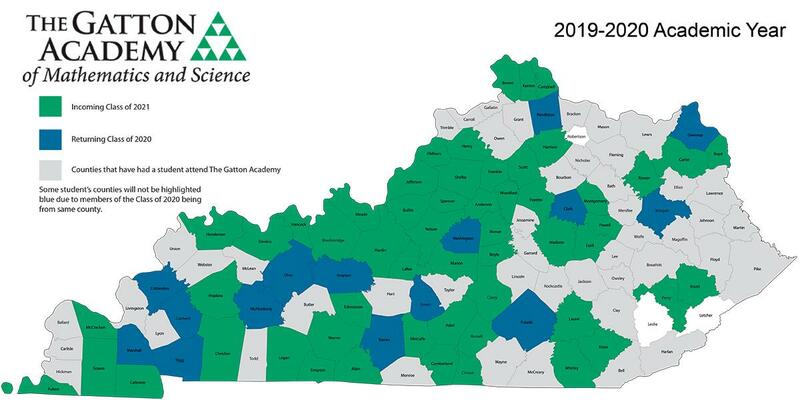 Starting with the Class of 2019, The Gatton Academy will select approximately 95 Kentucky residents each year to attend the program. Submit all required materials no later than February 1 of sophomore year. Students are selected based on SAT or ACT scores; academic grades from ninth and tenth grades; interest in advanced careers in science, technology, engineering, and math; student responses to application essay questions; interviews by Academy staff members; and recommendations from teachers and other individuals who can attest to a student's need and preparedness for the program. Rigor is at the heart of The Gatton Academy's academic curriculum. As such, it is important that prospective students seek challenge in their coursework leading up to admission to The Gatton Academy. Middle school students should consider taking Algebra I by the eighth grade so they can complete both Geometry and Algebra II by the end of their sophomore year. Though many districts are offering Algebra and Geometry to advanced middle school students, other districts are not. The desire to attend The Gatton Academy can serve as a springboard for encouraging districts to offer this option to students. Even though some schools limit Advanced Placement options to freshmen and sophomore students, all available opportunities for advanced and honors courses should be sought. All students applying to the Academy in their sophomore year must have completed Algebra II. There are three specific elements our admissions staff looks for in Academy applicants: maturity, personality, and individuality. Maturity is gauged as the academic preparation necessary to be successful in university-level study while, in tandem, addressing the challenges of living in a residential environment. Service learning is often a great way to develop maturity and a sense of one's responsibility to self, family, and community. Personality refers to the passion that students bring to The Gatton Academy for math and science. While numerous students make good grades in these subjects, it takes a student who has a passion for them and wants to pursue an advanced career in STEM to be the right fit for The Gatton Academy. Have you participated in a science fair? Are you involved in STLP at your school? Our admissions team looks for activities both inside and outside of the classroom that defines a student's interest in math and science. The Academy has compiled a list of summer programs available around the country for middle and early high school students interested in math and science. Finally, we look for what makes a student an individual. We anticipate this year's pool of applicants to reach 400 students from across the state. What makes you stand out as unique? Your awards and extracurricular activities are useful in this area. We are not looking for the longest list of accomplishments; instead, we are looking for quality and commitment. The Academy understands that students are only beginning their high school careers and will have had limited options for leadership in clubs and organizations. It's never too early to begin thinking about these tests. While the EXPLORE and PLAN tests will familiarize students with the format of the ACT, the materials on these tests is appropriate to the grade level in which the test is given. There is no substitute to taking a full ACT or SAT exam. Many students find their scores improve as they become more comfortable with the expectations and pacing of the test. All students who wish to apply for The Gatton Academy must have taken either the ACT or SAT prior to the submission deadline. The College Board recommends taking the ACT at least two times before a student enters college. As such, The Gatton Academy recommends students take the exam at least once during their sophomore year so that scores reflect the current aptitude of the student. If possible, students are encouraged to test in June after their freshman year and in December of their sophomore year. The ACT's Fall test dates are available on our Timeline page. The Gatton Academy representatives will conduct information sessions across Kentucky during each fall semester. Information sessions are a wonderful opportunity to speak with a member of The Gatton Academy's staff face-to-face without having to travel to Bowling Green. For more information on where we have visited (and those visits we have planned for the fall), please visit our Recruitment and Preview Days page. In order to allow students and parents the opportunity to experience The Gatton Academy living/learning environment, The Gatton Academy is pleased to offer preview days during both the fall and spring semester. Middle and high school students and their families are invited to attend Preview Days to tour Florence Schneider Hall, speak with Gatton Academy students, their parents, and staff while experiencing life within The Gatton Academy community. The Preview Day session normally begins at 10:00 a.m. central time and concludes at 2:00 p.m. For more information on dates, please visit our Recruitment and Preview Days page. Members of the Gatton Academy staff are always available to answer questions via email at academy@wku.edu or by telephone at 270.745.2971 and should be viewed as a resource when considering this educational opportunity. It is important that families fully understand this academic opportunity when considering it as a choice for their student.